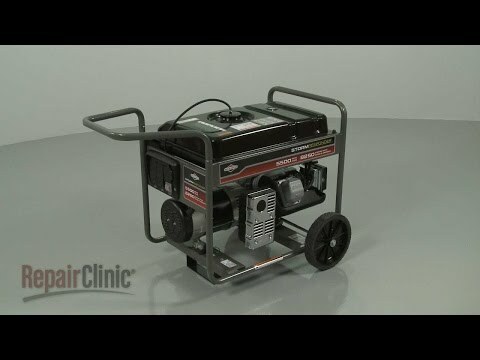 Portable generators use gasoline to conveniently provide electrical power during sudden outages or for outdoor purposes such as running job-site tools or camping equipment. There are a few important maintenance and safety tips that will keep your generator operating optimally. For safety reasons, only operate the generator outdoors – far away from your home's doors, windows and vents. Garages are not suitable. Generators produce carbon monoxide, a deadly, odorless, transparent gas, so there is great risk of carbon monoxide poisoning if there is not enough ventilation in the operating area. Your generator's air filter should be cleaned every 25 hours of use and replaced every 100 hours or every three months, if the generator is used frequently. Check the oil level every 8 hours of use and change the oil every 50 hours or once per season. If fuel is splashed on a hot engine part, such as the muffler, it may ignite and start a fire. Drain the fuel if stored for extended periods (i.e. if your generator is only used in emergency situations) or add fuel stabilizer to fresh fuel if used more frequently. Fuel stabilizer will prevent buildup in the carburetor. Keep the generator clean and dry. In wet weather, cover the generator with a canopy. Only operate a generator outdoors, far away from home windows, doors and vents. Turn off the generator and let it cool before adding fuel. Use a heavy-duty, outdoor extension cord to plug in appliances. Do not overload the generator. Consult the owner's manual for specifications. Never touch any electrical wire, switch or plug on or near a generator when it is raining or snowing outside. Water is an excellent conductor of electricity; you can be injured or killed by an electrical shock if you touch one of these items when you are wet. First, determine what you want to be powered by the generator. If you're looking for a generator to power your major home appliances, make a list of essential appliances along with their peak watts usage you want to power in case of an emergency. Many people use a generator to power their essential appliances such as refrigerator, sump pump, furnace and lighting and electronics. Next, to determine what wattage you'll need your generator to power, calculate the appliances' start run and peak wattage. Use an energy usage meter to measure consumption of various household lights and appliances. You should only run your generator at half of the rated wattage to get maximum run time. This improves fuel efficiency and leaves you the needed start-up wattage for the largest appliance. Warning: If you do not use the half-capacity rule of thumb or factor in startup wattage, you will likely trip the circuit breaker on the generator when your largest appliance turns on. If you intend to run appliances and lighting to a home, it's wise to have the generator wired to a transfer box next your home's electrical panel. It is important to have an electrician install the box to be sure it is done safely. An improperly installed box could allow electricity to flow back into the power company's grid and kill a worker trying to restore power to your house.